Starting in Göcek, a quiet resort town in a lovely setting on the Gulf of Fethiye this cruise follows the convoluted shoreline of Caria, made up of deep inlets and long peninsulas forming a complex and diverse geography where land and sea constantly embrace one another. 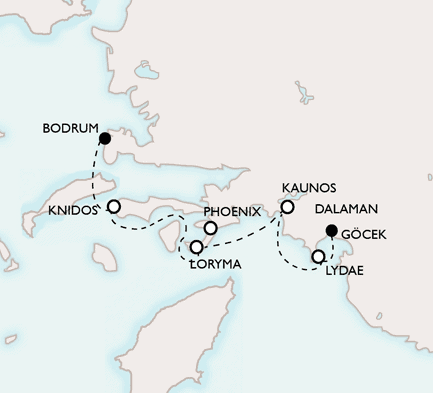 It ends at the lively harbour of Bodrum, ancient Halicarnassus and the birthplace of Herodotus. Average rating 5 out of 5 from 372 reviews for Cruising the Carian Coast – from Mediterranean to Aegean, according to AITO reviews. Day 1: Our boat is about 30 minutes from Dalaman airport at Göcek, a pretty harbour on the Bay of Fethiye, on Turkey’s Mediterranean coast. Welcome drink and dinner on board. Day 2: We head south to the beautiful inlet of Ağlımanı, from where we will walk up an ancient track to ancient Lydae, shrouded in mystery. Monumental tombs stand on the crest of a hill overlooking a forgotten valley filled with the tinkle of goat bells. Day 3: Cruising west we take a boat through a lagoon and up the reed-lined Dalyan River to the extraordinary ancient city of Kaunos. Its monumental public buildings, surrounding a silted-up harbour, speak of its once great wealth and fame, as do its uniquely elaborate rock-carved Temple Tombs. Day 4: We head inland from Serçe Bay, famous for its proliferation of shipwrecks, to explore Phoenix, a wild and remote citadel city, offering great views of the surrounding land- and seascapes. Still barely explored by scholars, Phoenix is a puzzle waiting to be solved. Day 5: We continue to Loryma where the island state of Rhodes erected a magnificent fortress guarding a strategic bay, to protect itself and its possessions from attack. The site, accessible only by boat, is one of the best-preserved examples of its kind. Day 6: West to spectacular Knidos, where decades of digging, still ongoing, have revealed a beautiful and well-planned city. Set at the very tip of a long peninsula jutting into the Aegean, her superb double harbour could be accessed from both east and west, providing protection for generations of ships and making her rich from the lucrative seaborne trade. Day 7: A last chance to swim as we cruise north to Bodrum itself. In the late afternoon we visit the Mausoleum of Halicarnassus, one of the Seven Wonders of the Ancient World and Bodrum’s magnificent Crusader castle, (due to re-open Spring 2019), which now houses one of the finest museums of underwater archaeology in the world. A final opportunity to shop. Day 8: Transfer to Bodrum airport, about 40 minutes away. We recommend you arrive at the gulet in Göcek (approx. 30 minutes from Dalaman airport) in the late afternoon/evening. Embarkation is from 17:00. You are more than welcome to arrive earlier to drop off your bags, but please be aware that the crew will be busy cleaning and tidying making everything ready for your group so you may not be able to settle in to your cabin. Departure time can be subject to change depending on weather, harbour or other conditions. Disembarkation in Bodrum (approx. 40 minutes from Bodrum airport) is around 09:00. We will arrange local transfers from Dalaman Airport and to Bodrum Airport on the first and last day of the tour.